Copper prices are often mentioned in TV news and also in newspapers. You can find a lot of articles that mention the price of this commodity. Reporters often mention these prices together with some movement in prices of stocks. Why are they doing it? Is there some connection between copper prices and stock market online trading ? There is some reason why copper commodity online trading prices are so often mentioned in the news. As this base metal is a widely used material for all kinds of infrastructure projects and feeds into many consumption products, it has been a long held view that this metal is a real-time indicator of activity in the world. If copper prices are rising, it is sensible to expect a booming economy. This is the results of PhD. in economics. It has also intensified with the construction boom in China since the year 2000. The Chinese demand for this commodity has been enormous since start of this century. Investors had reacted to this and pushed the price of this commodity up. Copper mining companies benefited a lot from this demand too. The demand for copper sometimes leads to strange results. Especially in China, where you can expect everything. Chinese developers have been using copper as collateral for their shady financing deals. The Chinese government has decided to start pushing hard against raising property prices in the high end market. Via raising lending rates and tightening loan conditions, it makes financing for developers much harder. But the smart Chinese found a way around and through borrowing money from a bank on a L/C basis for the purpose of copper procurement. Banks were quite happy to do this kind of deal as nobody scrutinizes this kind of financing because it is classified as a standard L/C note. And such approach goes well in hand with unofficial or indirect lending, which reached as much as 46% of all new financing in Q1 2011 – here, we are talking about all the trust loans, bank acceptance bills, insurers funding, etc. Basically, what has been going on is that some developers got credit for purchasing copper which helped them finance their real estate projects. This costs the buyer 30 bps for 90 days and around 70 bps if they defer repayment to 180 days. The developer eventually finds himself with a long position in the real estate project, a long position in copper and a short position in USD due in six months. If developers are not be able to sell the new apartments within next few months quickly enough, they will have to liquidate their copper stocks as soon as possible at low prices. As these actions were huge in China it really distorted real copper prices in 2011. The first option is the copper commodity future online trading prices. Copper is also traded on futures markets in the USA. The major copper future is traded on the New York Mercantile Exchange (NYMEX) with symbol HG. Although it is possible to monitor the most active future I think that it is much better to monitor copper prices with continuous copper future contract. This artificial contract is created by data providers and allows them to monitor prices without needing to know what contract is currently most active. This continuous contract is provided by several data providers like Esignal in my case. I use data from Esignal in my stock chart analysis software Amibroker. Here is a chart of HG futures from Amibroker. Another option is to use some ETF that tracks the price of copper. 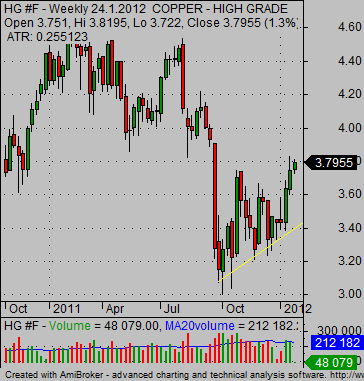 This ETF invest in copper futures and so it is a good proxy for monitoring copper prices. Another quite new fund tracking this metal is The United States Copper Index Fund with ticker symbol CPER. It is an exchange traded product (“ETP”) that holds futures contracts in its portfolio. CPER issued units may be purchased and sold on the NYSE Arca. The third exchange traded product is CUPM – Pure Beta Copper ETN. This is an exchange traded note that tracks Barclays Capital Copper Pure Beta TR Index. The index is comprised of a single exchange traded futures contract, except during the roll period when the index may be comprised of two futures contracts. However, unlike many commodity indices which roll their exposure to the corresponding futures contract on a monthly basis in accordance with a pre-determined roll schedule, the Index may roll into one of a number of futures contracts with varying expiration dates, as selected using the Barclays Capital Pure Beta Series 2 Methodology. There is one problem with CPER and also with CUPM. They are quite new products and they that don’t have good liquidity right now. Their trading volume is quite low and so their charts are not very readable. 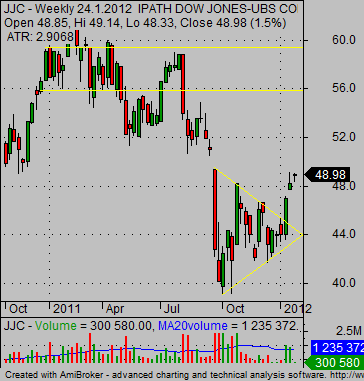 So I recommend sticking to futures charts or to charts of ETF with symbol JJC. These two have nice and readable technical charts that can be analyzed.